One of the nicer new bars I’ve seen open in Central Texas in the past 15 years. 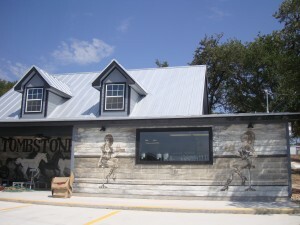 Tombstone Texas Bar and Grill is gorgeous. While I have no doubt that it will be embraced by the good people of Liberty Hill I have a feeling plenty people from Austin proper will be making the trip out from downtown to see what all the fuss is about. It’s going to be interesting to see what talent they book once they get their mammoth amphitheater up and running. It’s supposed to hold nearly 4k people so they’ll be able to put on a Willie show if they’re so inclined. The owners also have big plans for an adjacent structure on the property. Fine dining in Liberty Hill? Could be the next big thing. This entry was posted in Rural Texas, Texas Daily Photo and tagged liberty hill, tombstone texas bar and grill, Williamson County. Bookmark the permalink. Wife and I had dinner there tonight. Had the Shrimp basket. Excellent, both the fried and the grilled. The hush puppies were the best I’ve ever had, they were so soft! Fried pickles were done right too: chips, not spears. Cole slaw was good for what it was, I don’t care for that particular style of slaw, I like more finely chopped with a creamier sauce. Prices were very reasonable, ample parking, great service! I’m a mark for good hushpuppies, definitely heading out that way, wish it was a tad closer though.